Sometimes I see an idea and I think, "I have to try this" but then I just never seem to get around to it. This time though, I needed to try it immediately! I first saw an example of this manicure just a few days ago on Facebook. It was a post from My Simple Little Pleasures for her latest video tutorial. She had seen Wacky Laki's Valentine's Day Gradient post (who had originally been inspired by a post from October by Globe & Nail). I've been slacking lately on reading other blogs so I totally missed it when Wacky Laki posted her Valentine's Day gradient, so I'm so happy that I caught Colette's Facebook post in order to discover this look. All three of these ladies did a fantastic job and it just made me want to try this manicure ASAP. Colette's video does a great job of explaining how to do this, and Globe & Nail also posted a tutorial on her blog to correspond with her original post, so I don't really need to go into great detail myself on how this was done. 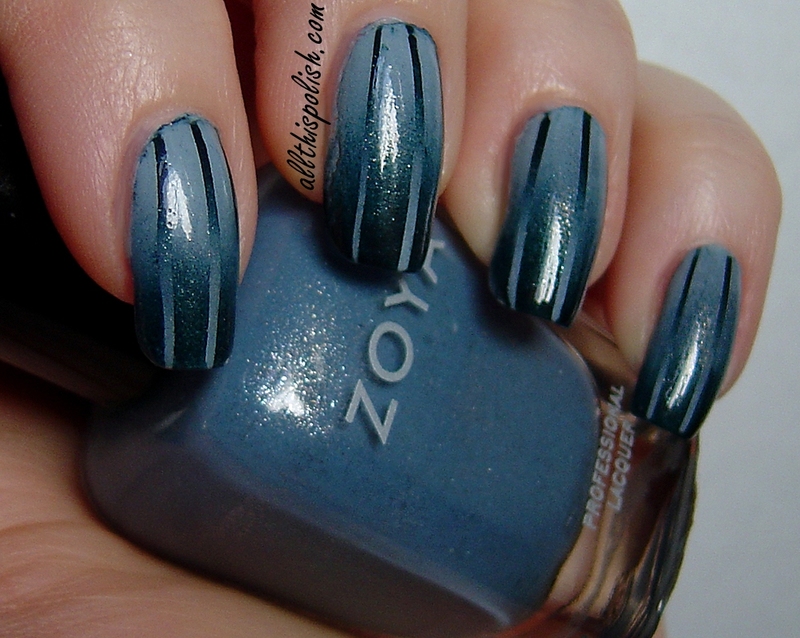 The basics are that I started with one coat of Zoya Kristen as a base for my gradient. Kristen applied great, but on its own, I definitely would have needed a second coat. Using a makeup wedge/sponge, I sponged on my gradient using Zoya Kristen, Zoya Skylar and Zoya Cynthia, with Cynthia at my cuticles, Skylar in the middle and Kristen at the tips of my nails. I've tried a few different techniques for gradients and they all seem to work just as well for me. For this particular manicure though, I used the same technique as Colette did her in YouTube video and applied all three polishes directly to the sponge. I applied a second coat of sponging to the gradient to make it more opaque then top coated with Seche Vite. Once it was completely dry, I applied three pieces of striping tape to each nail and repeated the gradient (two coats) but with Kristen at the cuticle and Cynthia at the tip. Then came the moment of truth, when it was time to peel off the striping tape. I was a bit worried that some how I had managed to screw it up. But I peeled off the striping tape and it had worked and it looked awesome! I was so thrilled. I cleaned up any polish that had gotten on my skin from sponging and applied top coat to finish it off. This did take some time, probably about an hour and a half or so, plus clean up, but totally worth it. I didn't tape off my nails or apply Vaseline or chap stick so clean up took a little while. But then again, I'm weird and I sort of actually enjoy clean up on my manicures. It's kind of calming or relaxing for me in a weird way. I just use pure acetone and a small chisel tip blender art brush I picked up at Michael's. And luckily, I didn't have any major problems with any of the Zoya polishes staining my skin. This is so amazing & beautiful!! You are very talented!